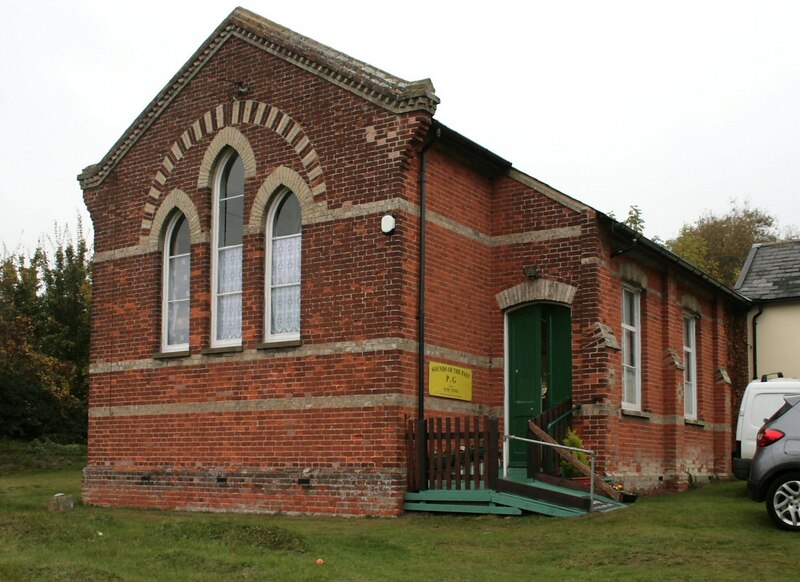 Oaklands Museum, Moulsham Street "Annual General Meeting"
Despite some technical issues with the PC and projector the AGM got underway with Chris reiterating his desire to stand down as Chairman. 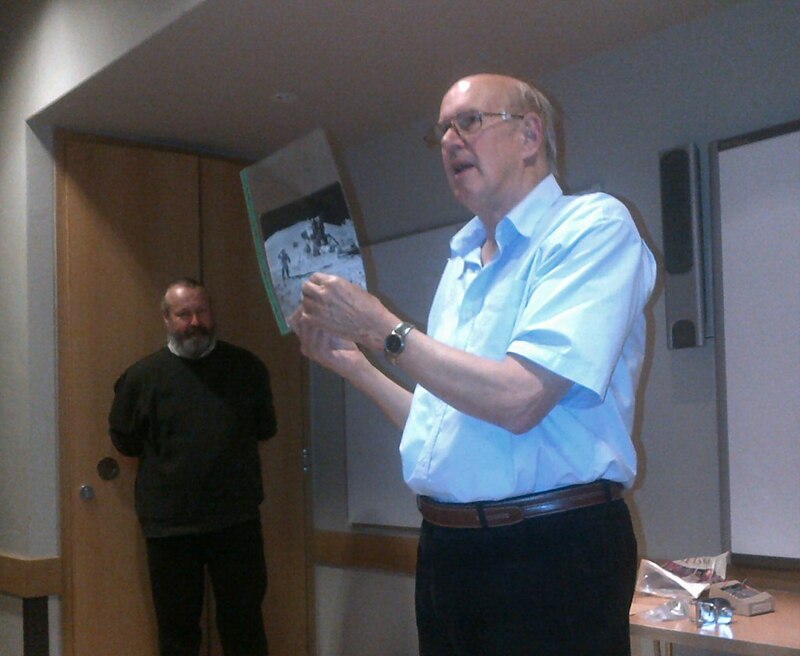 President’s Report: Tony, G4YTG took the floor to give a quick appraisal of the club from his point of view. 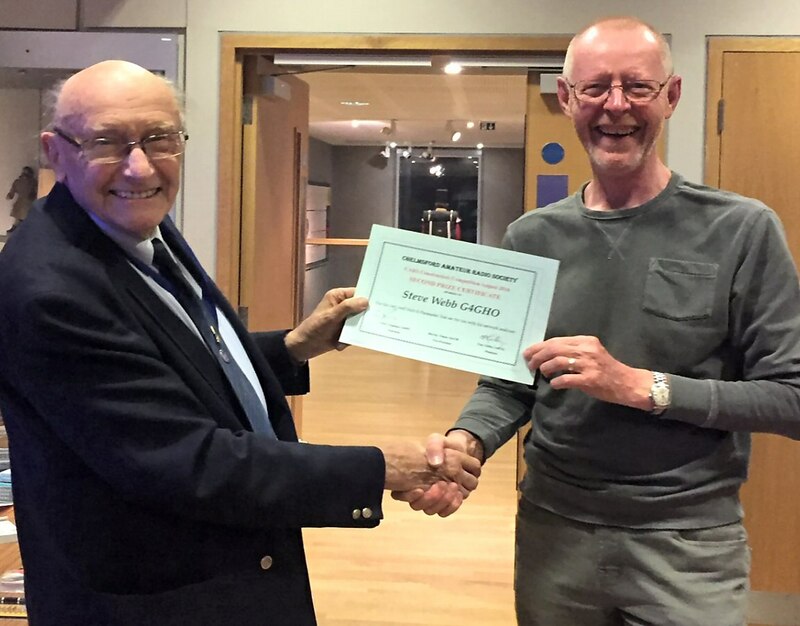 Next came the presentation of the Constructors Competition 1st place award to Alan, M0IZW for his weather station, and certificates for the runners up Steve, G4GHO for his S-parameter test set, Dave, M0HBV for his wobbulator and Frank, M1GFE for 1st time entrant. Tony then passed it back to the Chairman for his report. Our thanks to Peter M0PSX for the photos below. 11 Skills Night Danbury Village Hall with Pete M0PSX, Society . 2 Days Marconi Sailing Club. Treasurer’s Report: Next up was the Treasurer’s report. A balance sheet was available showing income over expenditure. Queries were received in light of the income to expenditure for the Intermediate Course from Oliver, M0WAG. Our Treasurer Myra, M0MYR explained that the previous Treasurer had placed some of the income in a broader heading on the balance sheet. 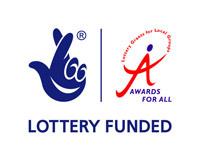 Comment was made regarding the assets of the club being included and that the list is far from complete; this is an ongoing issue that needs a dedicated volunteer to head up, as your Chairman has run out of free time at present. Please contact me if you wish to take on this task. Training Report: Next up was the Training Manager’s report (Chris again; Would you like the role of Training Manager? Please contact Chris). In the past year we have had 48+ candidates on 10 courses at all licence levels over 45 weeks (on Thursdays). Pass rate is good, and this is down to the dedication on the CARS Training Team. Skills Report: Peter M0PSX next gave an appraisal of the Skills Nights. 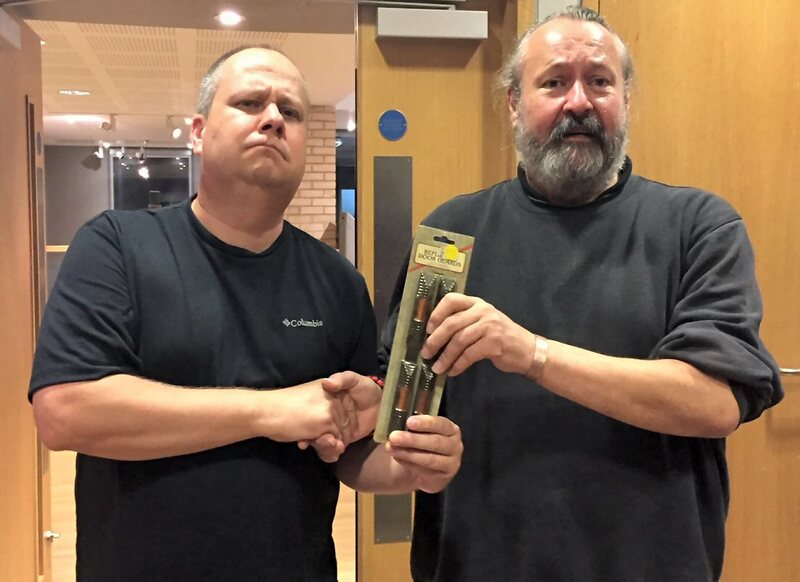 Committee Elections: The CARS Committee all stood down (with Steve G4GHO retiring, though remaining as editor) and the floor was passed to President Tony, G4YTG, who ran the re-election of the new Committee. Chris reiterated his desire to stand down as Chairman due to time constraints and asked if anyone in the room would like to take on the role, to no avail. 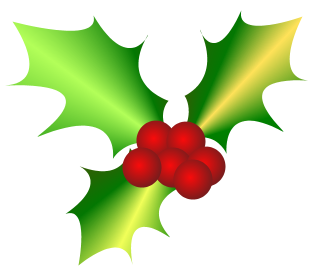 Not wishing to leave the committee without a Chairman, he decided to continue until Xmas, whilst looking for a volunteer for the position of Chairman. 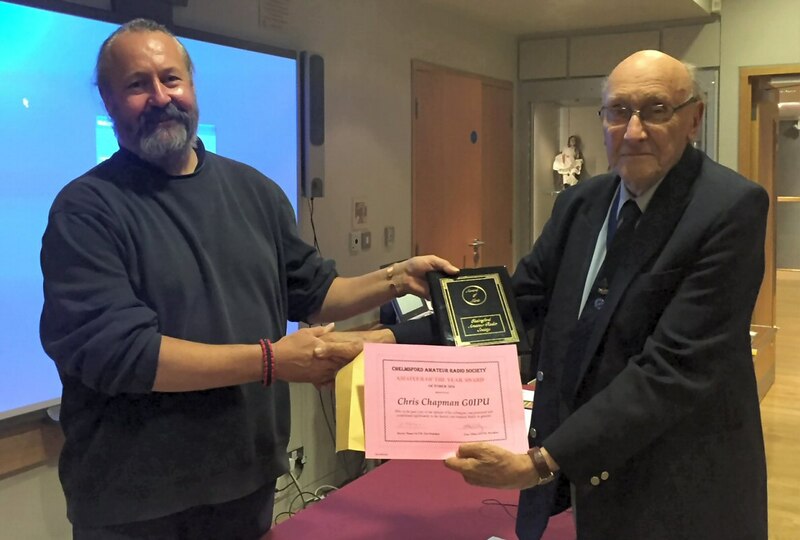 The result of the vote for Amateur of the Year turned out to be Chris... whilst Steve G4GHO also received credit for his excellent work on the CARS Newsletter. AoB: Finally there followed a discussion on “What do you want from your club?” that was mostly dominated with “where are all the newly licensed Amateurs from the training courses?” This was an interesting debate with no ultimate conclusion. We ran out of time for the last item on the AGM - Events & Talks, but we are always open to suggestions. If you have any ideas, requests or feedback on the content you are offered or would like to see, then please do not hesitate to contact any Committee member and it will be gratefully considered. 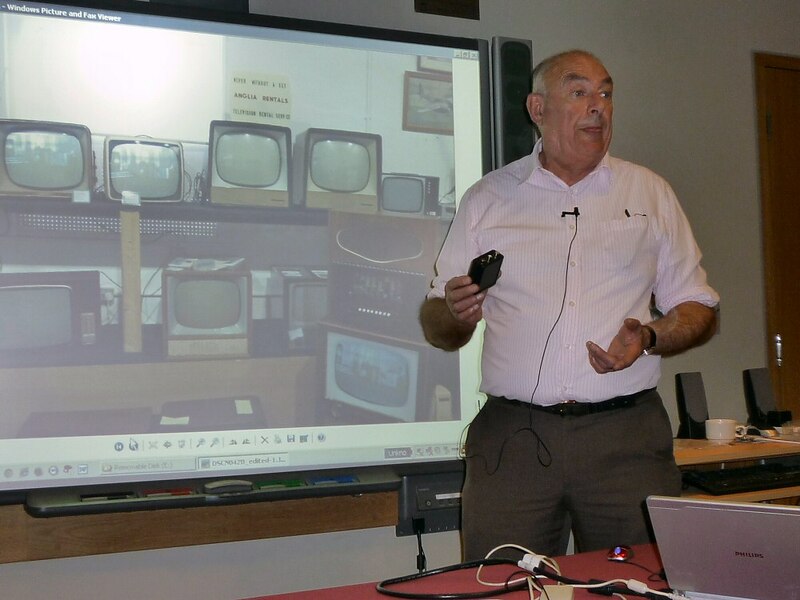 Oaklands Museum, Moulsham Street "Three 25 Minute Talks"
Jim Salmon 2E0RMI started the ball rolling with his talk entitled "How Did I Get to Here", a look back of how his interest in all sides of radio broadcasting began. David Ingrey M0HBV talked about his interest in "Sounds of the Past" and how his skills at broadcast set renovation are put to good use. 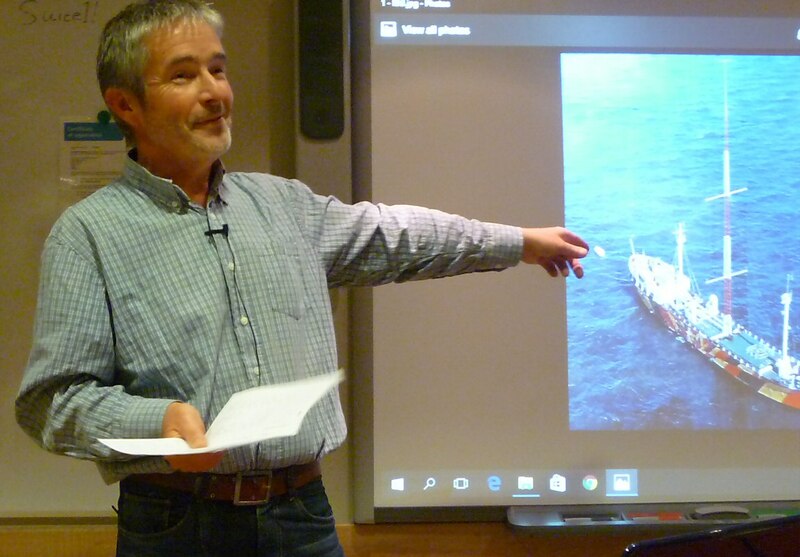 Murray G6JYB, brought us uptodate with latest information on the "Future 5G Communications" and how some astonishing antennas may affect all aspects of our lives. 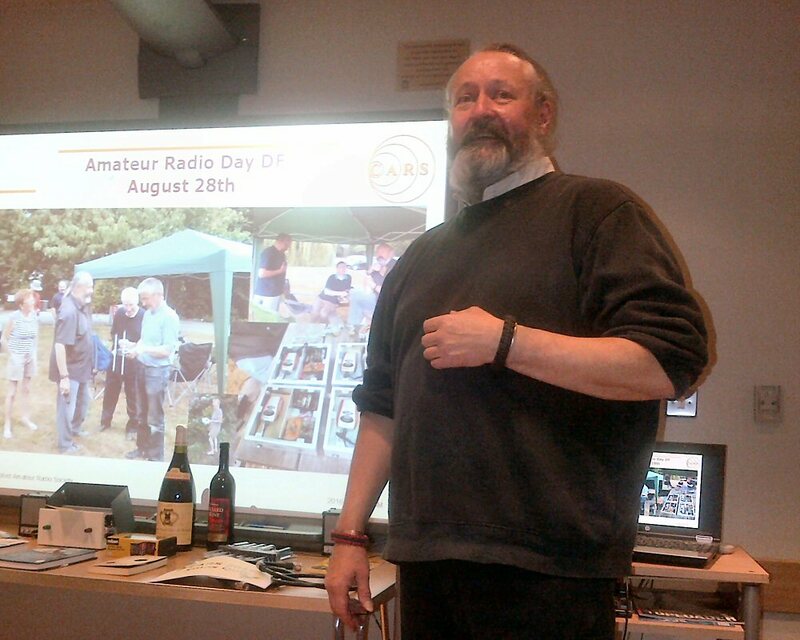 Jim 2E0RMI started his talk by recounting his youth and listening to Pirate Radio which in the 1960s was popular and eventually led to the reform of the BBC Radio output and the creation of Radio-1. Photos, video and sound recordings contributed to a packed and interesting tour thru broadcasting history which had clearly been an inspiration to him. 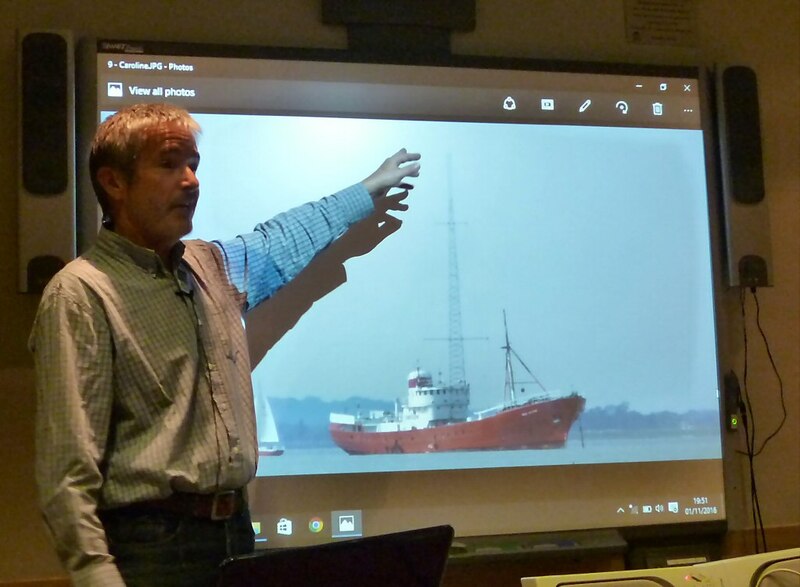 Jim recounted the startup of Radio Caroline (orginally using the Mi Amigo) in conjunction with Radio Atlanta. Radio Caroline has had several comebacks in various forms, including on the MV Ross Revenge in the 1980s. 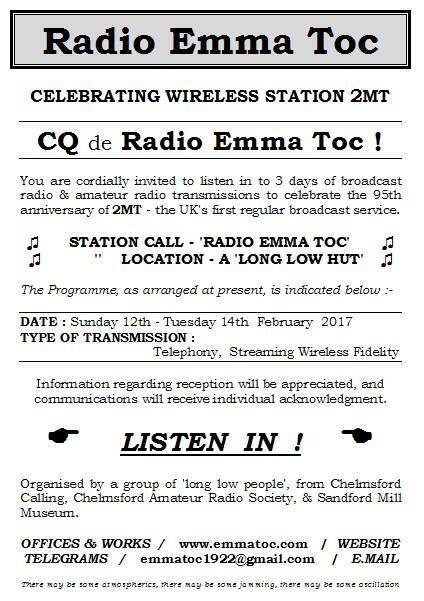 For a short while Jim had run his own FM radio station, "Chelmsford Calling", under an Ofcom Community Radio licence. However the expense and burden of running a small radio station is significant. Nowadays computerised internet streaming is rather easier and will be used for the 2MT event (see below). 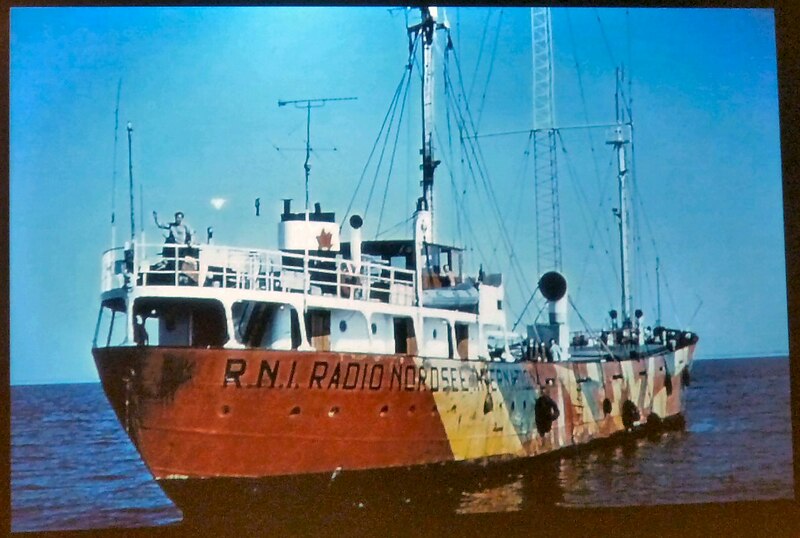 One of the survivors from the Pirate era is the MV Ross Revenge which is now anchored in the River Blackwater where a fair amount of effort has gone into its physical restoration and at one point an Ofcom Special Event Station - GB5RC! (recently featured on TX Factor Ep-13). Jim finished by highlighting his current interest in 2MT and the desire to celebrate its 95th and 100th anniversaries. 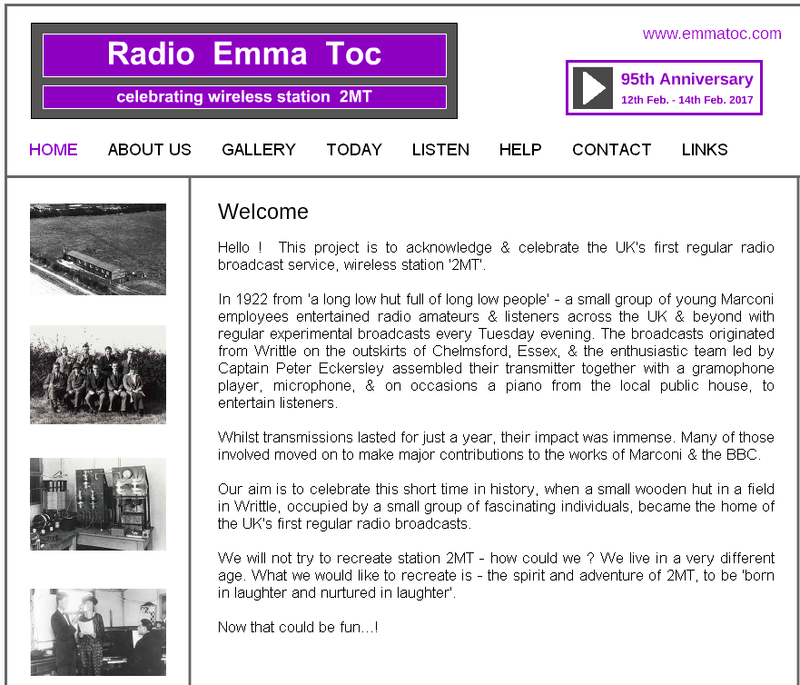 Wireless station 2MT - 'Two Emma Toc' - commenced transmissions at 7.15pm on Tuesday 14th February 1922. 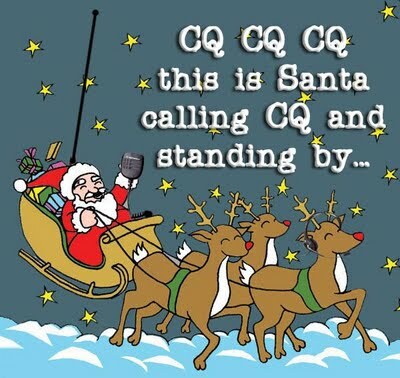 The aim is to celebrate the centenary of this first broadcast along with other amateur radio & 2MT enthusiasts in February 2022, however this seems a long time to wait! So the plan includes an intermediate celebration for the 95th anniversary, on Tuesday 14th February 2017. 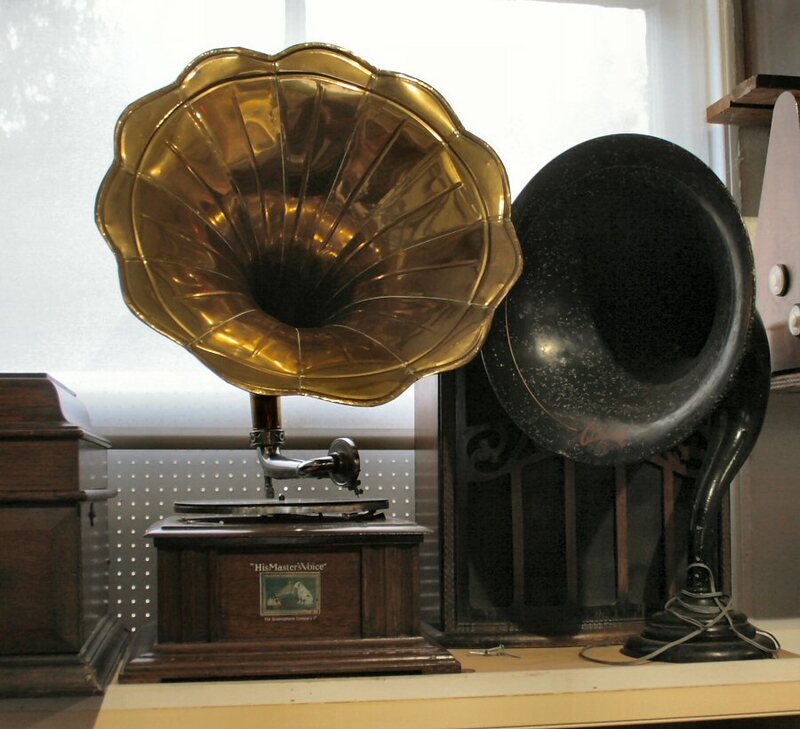 David M0HBV displayed a series of photos of the 'Sounds of the Past Museum'. This has been set up by Paul Goodchild in a converted Chapel at Monks Eleigh in Suffolk (northeast of Sudbury). The collection covers old Radio, TV, portable record players and a variety of other eclectic memorabilia. In response to questions, David mentioned that this fascinating place does not have a dedicated website, so some links below should be helpful. 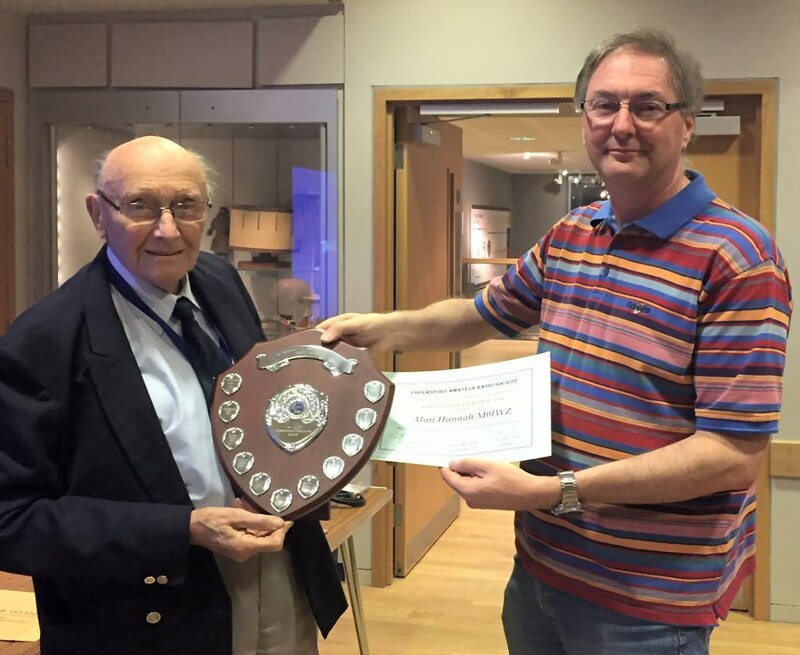 Our thanks to Dave for a few photos for this report as well. 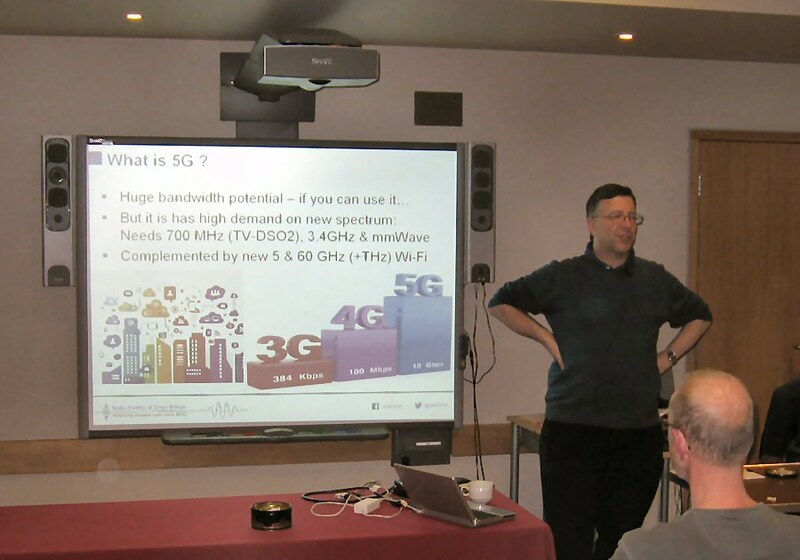 Following the break/raffle, Murray G6JYB showed a few slides on how forthcoming fifth generation (5G) mobile comms was aiming at unheard of data rates and frequencies (inc some TV and amateur ones) using Smart Antenna arrays that could create massive MIMO - although at the expense of TV and Amateur spectrum. The talk started with some history - the first 1G ETACS phones were like bricks. Then 2G-GSM was made a success by the likes of Nokia handsets, text messaging etc. 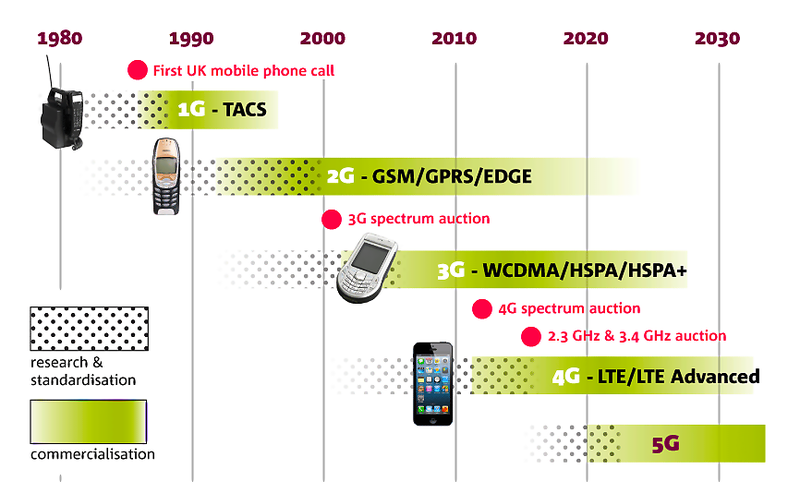 Nowadays Smartphones have evolved on the back of 3G and 4G data rates and internet access - although coverage remains an issue. 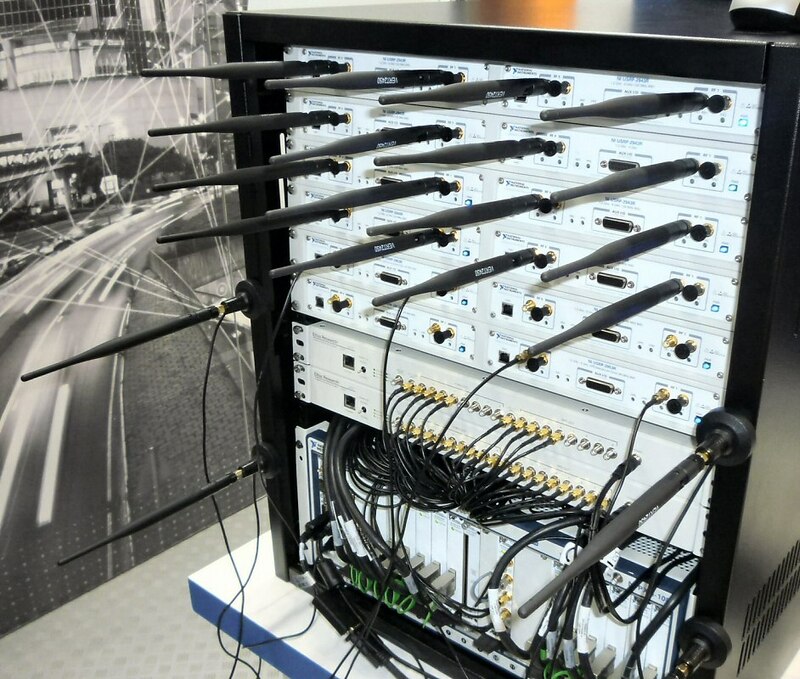 The next step 5G (aka IMT-2020), is based on new antenna technologies and frequency carriers that can offer order of magnitude increases (though it is not always clear what you might need it for!). The latter ones in particular provide multiple Gigabit capacity for crowded public spaces such as stations/airports, stadia etc. 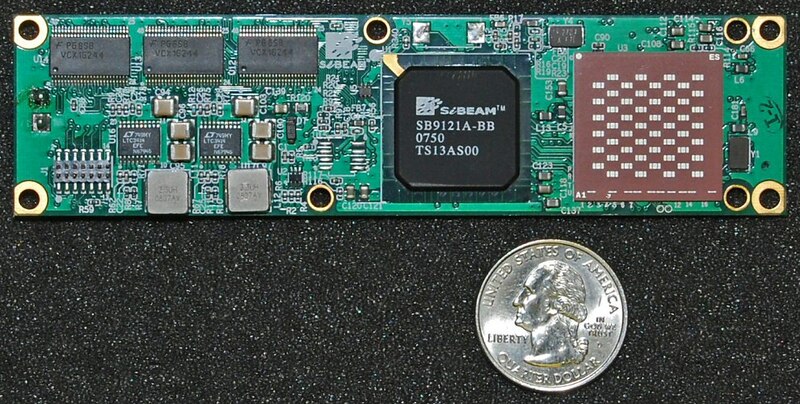 One of the enabling technologies for this has been the advent of low cost CMOS chips that can operate at mmWave frequencies (first developed in 2007 for 60 GHz Wireless-HD links for TV and Blu-ray players). The other innovation is the use of multiple antennas and large-scale MIMO for beam forming. 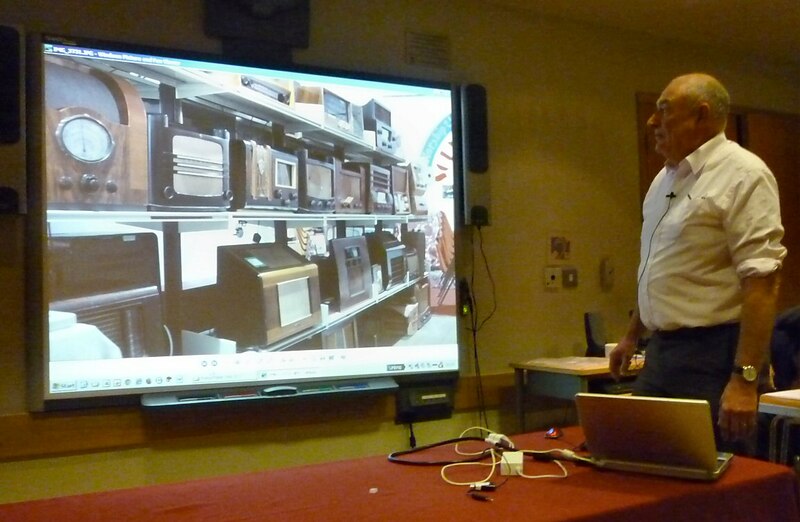 Murray had pictures of a number of current 3.5GHz MIMO demonstrations, up to 96 antennas. Whilst the theory and engineering does work, it ultimately is limited by what can fit a handset - at low cost. Unlike the more basic MIMO on home Wi-Fi this can serve far more users and can actively manipulate the wavefronts to track mobile users. 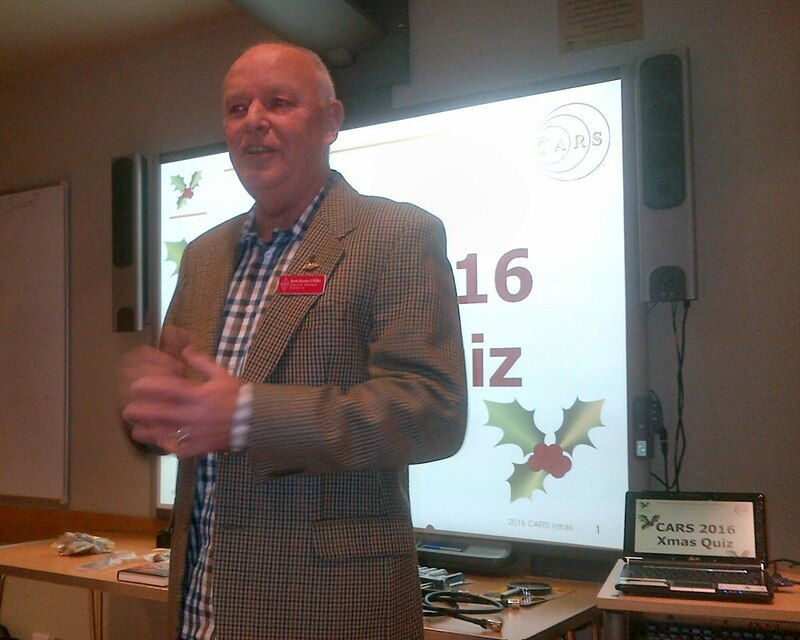 Oaklands Museum, Moulsham Street "Xmas Social & Quiz"
The evening kicked off with a couple of informal presentations. RSGB Region-12 manager Keith Haynes, G3WRO (RM12) came along to explain how the region is organised - it consists of Essex, Suffolk, Norfolk, and Cambridgeshire. Each county has its own local rep (a DRM). 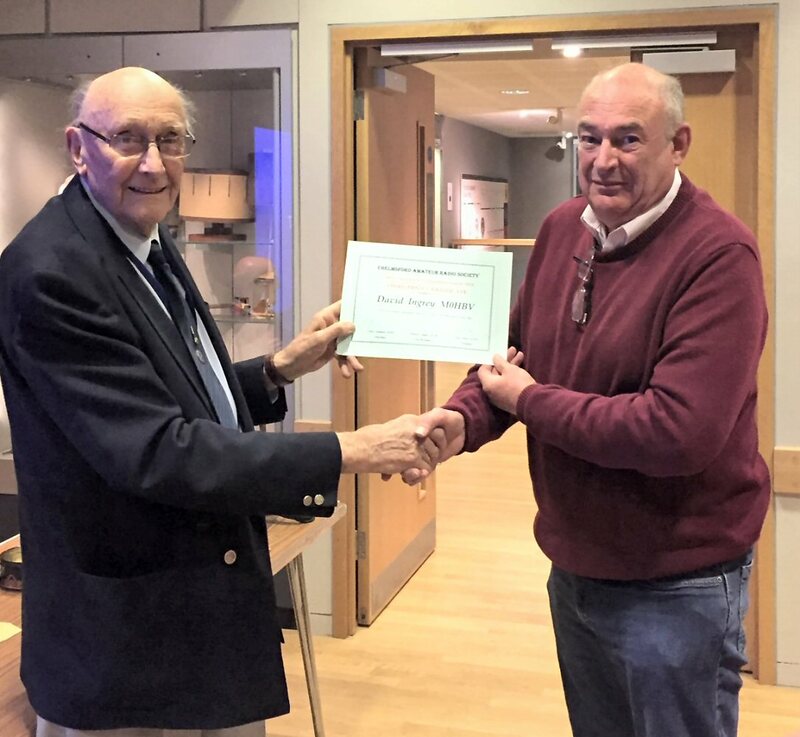 Essex has a lot of clubs, os unusally now has two reps - Vic Rogers, G6BHE (Essex South and East) is our DRM (and is also a coordinator for the SEARS Canvey Rally. Chris G0IPU then ran a slide show of the past years activities. The large and very colourful powerpoint file (originally meant for the AGM) reminded us of events thru the year. 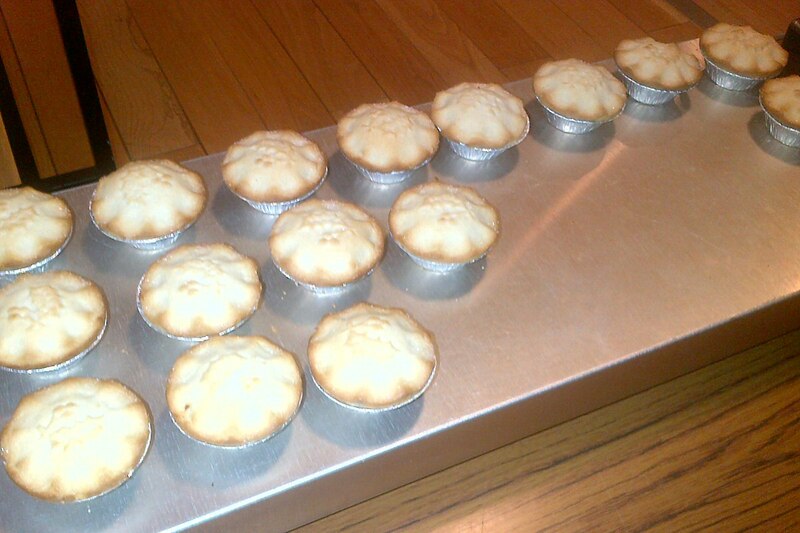 We then had a break where the warm Mince Pies organised by John G8DET proved to be popular! There were quite a few raffle prizes, including some drinkable ones. 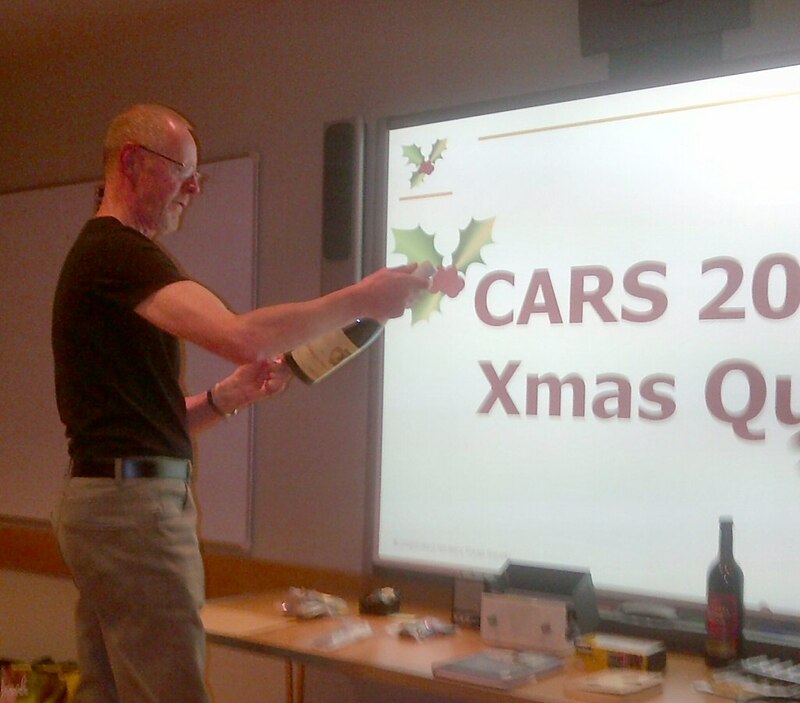 Following that, Murray ran the Xmas Quiz. 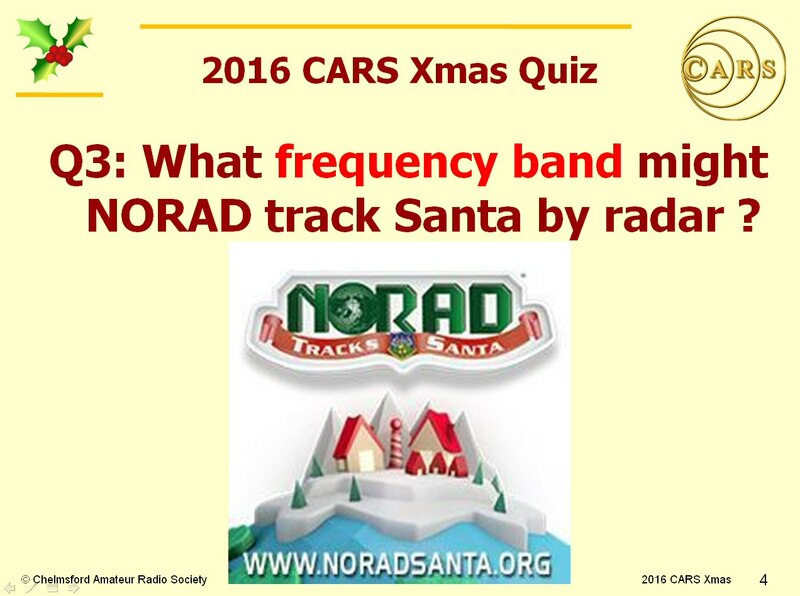 This had ten seasonal questions including the locator for the North Pole and the frequency band used track Santa. 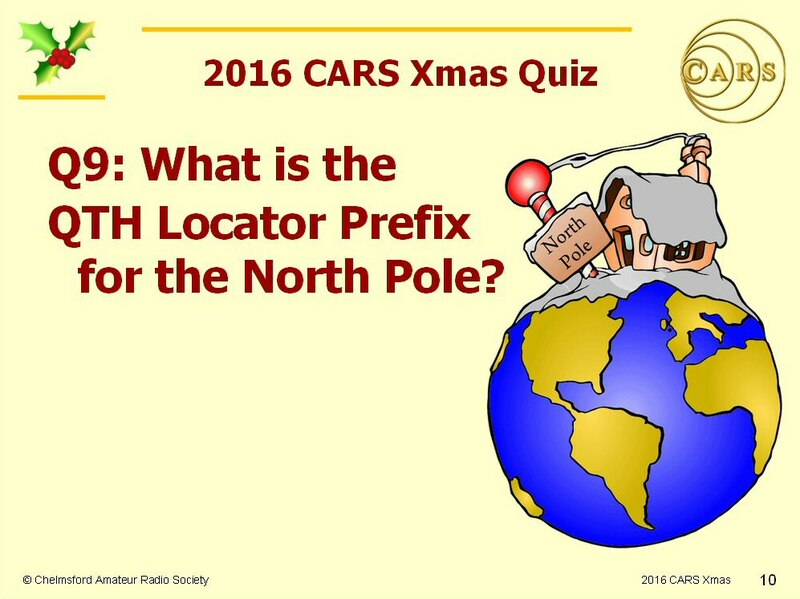 Q10 which was the seasonal anagram question was - "Hot Rod Cow". Finally John G8DET recounted a story of how he ended up with original Apollo PR photos from a skip many years ago.